Any soil, including poorly drained sites. Winter hardiness varies with variety. Some strains are killed by temperatures around -10F (-23 C), while especially hardy varieties can tolerate more extreme cold. When using annual rye to improve very poor soil, mixing a balanced organic fertilizer into the soil before planting will give better results. Raspberry and Garlic. Annual rye forms a very thick stand, and is normally grown alone to choke out weeds and boost organic matter, especially in new gardening sites. Walk over the planted site to firm the seeds into the ground, and then water to promote fast germination. Although customarily grown in fall, annual rye can be used as a fast-growing cover crop in all but the hottest summer months. Broadcast seed into cultivated soil so that the seeds are about 1 inch (2 cm) apart and one-fourth inch (.5 cm) deep. Mature annual rye plants can be difficult to dig out. In areas where annual rye is not killed by winter weather, mow down the plants and turn under the residue when the plants are young. 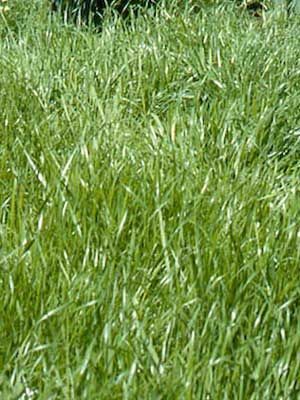 In a home garden, annual rye cover crops are easiest to manage if they are mowed every few weeks. The clippings make excellent mulch. Annual rye has few problems with pests or diseases.